Replacement:DEV-10009. The new version does not have the 6-pin header. This page is for reference only. I just realized I posted the comment on the hook ups on this product but I used the 5V version. Not sure if there is any difference .. just a note. What a great product. Being brand spanking new it took me a bit to figure out all the details on how to use this on a breadboard and a chip / crystal only. 1) To get started quick, just hookup the Vcc and Ground from the breakout to the breadboard and you can skip the regulator part of the tutorial. 3) Now Arduino with the Duemilanove (328) setup should work. If I did anything stupid and/or am passing on stupid advice please correct me. I have two of these 3.3v versions which I got in the past few months and they look ALMOST identical to the 5v version (which are NOT in stock as I write this). Looking very close at the bottom, (look at the 5v picture, not the one for this page) you can see the shorting pads, and on mine the default short is to the other pad. So to make it 5V I assume that all I would need is to cut and short just like the 5v breakout, but the opposite set. Looks like it would be pretty easy to modify for 5V - just remove the short SJ1, bring a jumper from the 5V side of C2 to the U1 side of SJ1, cut the 3.3v trace on the bottom near pin 4 of JP1 and bring another 5V jumper to that pin. Couldn't you just cut the trace between the left and middle pads (headers pointing down) of SJ1 and short the middle pad to the right one (see photos of back)? Confirmed. I made this modification and the 5V Vcc was correct. Sketch upload worked on the first try. The SJ1 is the blob of solder near the DTR label. I cut the trace between SJ1 and the capacitor instead of removing all the solder from the SJ1 itself. I cut the trace to JP1 Pin4, and used the SJ1 and the C5+ pole as convenient solder points (C5+ instead of C2+ since it's larger). My mac doesn't see the this device. My TX and RX lights are constantly lit. Any advice? Thanks!! 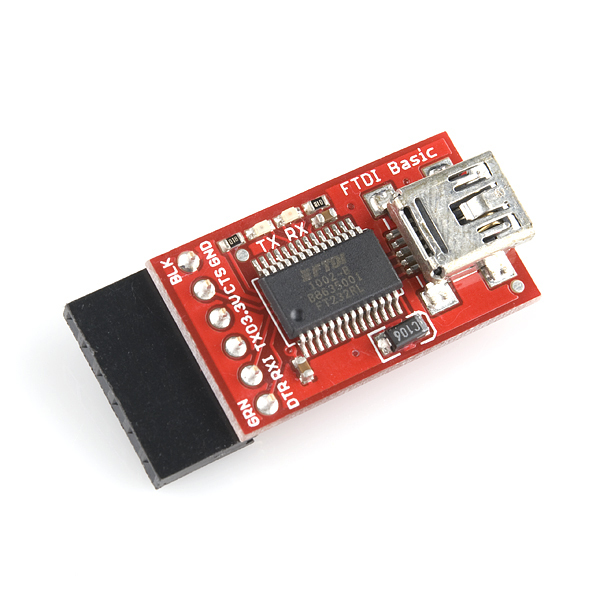 I think that means that the VBus pin on the FT232 is getting power but the device has not enumerated on the USB hub or something like that. There might be a solder bridge or lousy trace somewhere. 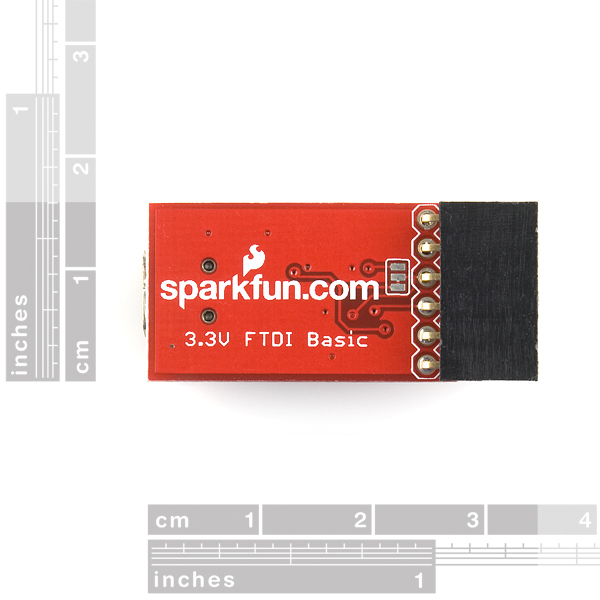 If you like, contact techsupport@sparkfun.com about having the item returned for testing. It would be nice to actually know how much power is available at the 3.3V pin. That said, it works quite nicely to test out a 3.3V TTL device if you want to connect it directly to a PC. I've used it for hacking together an interface to a GPS unit @ 50 mA. It works fine. Probably not a recommended use but it certainly is nice for prototyping. I want to program a pluto FPGA which this. Apparently I'd need to invert the TxD bit but not the RxD bit because it's asynchronous, any idea what this means? This board worked for a few hours, but now Windows no longer recognizes it. When I plug it into my computer, the Rx and Tx lights blink together a few times, and Windows loads it as an "Unknown Device". I've tried two Windows computers, and also on Ubuntu 9.04 with no success. Any ideas as to what could be wrong? Thanks for any help! I'm having a similar issue on a board I've made. The chip works fine for a while, and then all comms stop. The Rx LED just blinks for a while, and then stops. When I unplug and reconnect the device it gives me an 'Unknown device' error. If I let the board sit for a few hours and plug it in again, it works fine for a bit, and then I face the same problem. How is this possible? Either the chip is damaged or not! Reset tied to Vcc; Test grounded. Smoked it ! Probably Static Zap. I apparently did the same thing. The lights just flash in unison and the PC never finds the usb serial port. Its not a driver problem since other FTDI devices are working just fine. If there is a reset, I don't know about it. You guys really need to sell a 1x6 to 2x3 cable so we can use these for reprogramming the Duemilanove without having to use a handful of jumpers. Is there a version of this that is 3.3v and 5v in one pcb that is changed via jumper? Just to be sure... this is basically an FTDI 3.3v cable, right? 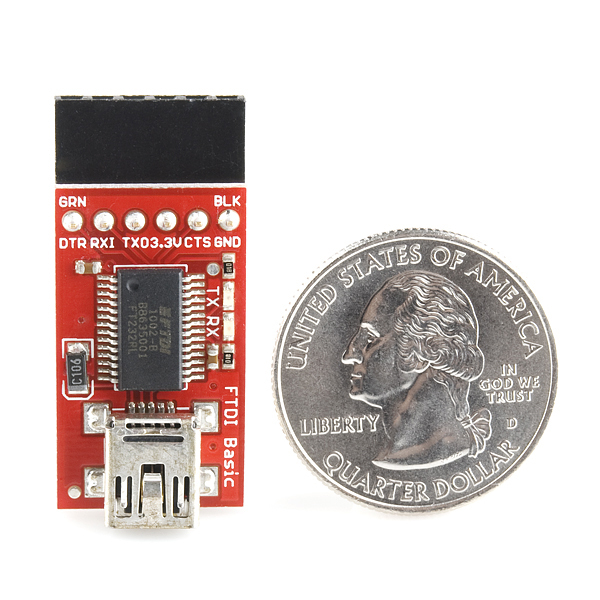 so i can use it to connect to a XBee adapter (from Adafruit)? 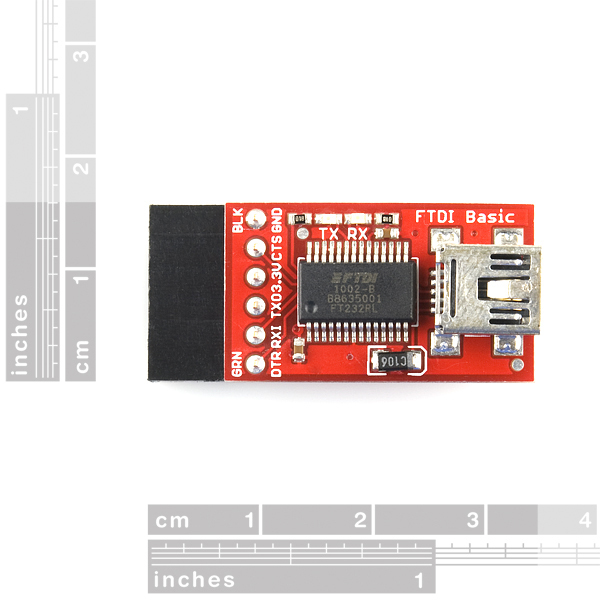 "The major difference with this board is that it brings out the DTR pin as opposed to the RTS pin of the FTDI cable". Looked at the Adafruit adaptor and I think you're right. It surely does look that way. Haven't tried it myself but looks like a great idea to use for testing the XBee command set. 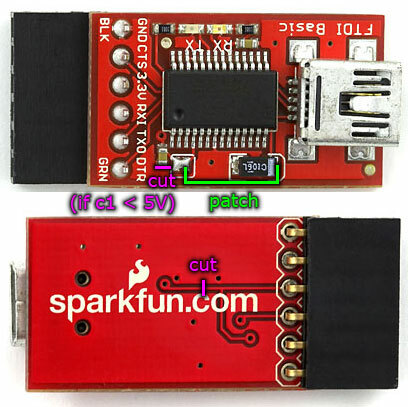 I'm using breakout boards and USB deelopment boards, but your idea looks like a solution that will work just as well. They've just implemented this with a simple 5V jumper, and it costs $5 less! Why are the tx/rx pins toggled? That's probably because TX talks to RX and RX listens to TX. Basically, it's a question of whether it's denoting its own TX/RX lines, or those of the mating connector. is this a 5v or 3.3v? It is a 3.3 Volt product, But you can modify the product to run off 5.0 Volts. how do i modify it for 5v? "Looks like it would be pretty easy to modify for 5V - just remove the short SJ1, bring a jumper from the 5V side of C2 to the U1 side of SJ1, cut the 3.3v trace on the bottom near pin 4 of JP1 and bring another 5V jumper to that pin." Will this work with the Parallax Propeller? Recognized properly as ttyUSB0 on first plug-in, by Ubuntu 8.04. No fiddling with configs or drivers was necessary. What are the Arduino Pro boards ? AVR32 maybe ? Something along the lines of the OMAP Beagleboard but using the Arduino IDE I would hope.